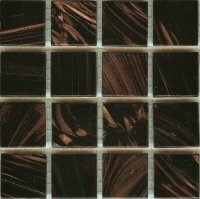 This is a dark brown vitreous glass tile with added gold coloured streaks / flecks. The pattern of streaks in each tile is unique so there is always something to catch the eye and to bring the tiles 'to life' when the light catches them! This tile has been described as "looking like Bournville chocolate but with gold in - almost good enough to eat" (though you definitely shouldn't eat tiles!). For art work this tile is ideal for bringing interest to dark areas like night scenes, mountains, tree trunks or caves. Used sparingly one sheet can go a long way and the gold in the tiles will catch the light and bring your work 'to life'. Did you know that Interstices is the term used to describe the spaces between mosaic tiles where the grout goes.